Finally, it's time for the much anticipated Beaded Face Brooch Swap 2007! 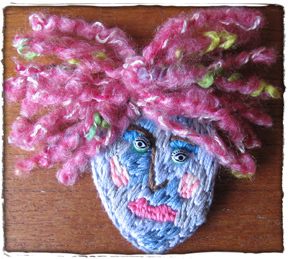 Create a brooch/pin no larger that 2 ½ x 2 ½ inches. Anything goes for the face as long as it implies a human face and has some beads. Polymer clay, buttons, paper clay, image transfer, bead or regular embroidery, what ever strikes your fancy. This is a 1 -1 swap. Due to me by September 28th. and return mailing label. If you do not send return postage, your pin is mine. International swappers welcome and encouraged. Please include a note with your real name and screen name, mailing addy, title of your piece and any other info you think might be nice to know about your piece. All pins will be swapped and mailed the first week of October. This is a fun, fast swap and great opportunity for all you newbies to try your hand at creating something. All participants will receive a goody bag with their return pin. Email me to sign up. No beads, but you could add them! This article has directions; just ignore the part about nail polish. August 19, 2007 by carol strand.